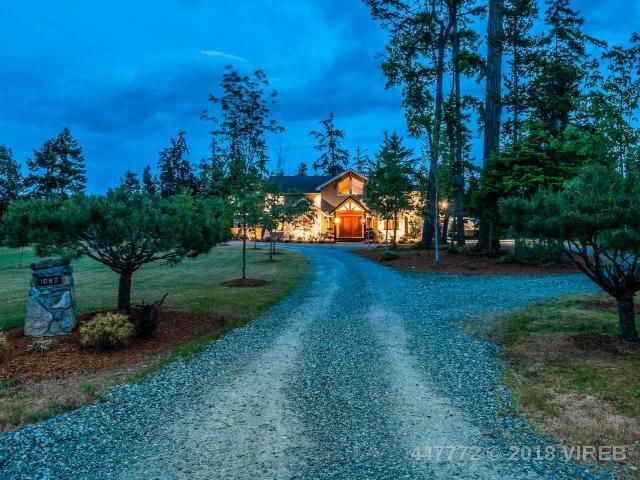 Upscale country living at its very best & only mins from all amenities! Don't miss this commanding & ultra-private Custom Executive Home on 3.90 acres boasting a huge detached Workshop with a 14' ceiling, power & water, an attached 3-car garage, & enough outdoor area to offer equestrian potential...perfect for a large family, horse lovers, or someone looking to run a B&B/Retreat that's mins from beaches, golfing, ocean/river fishing, horse riding, & within an hour of skiing! The foyer has custom fir accent walls, Italian tile flooring, twin sweeping curved staircases, & a 26' cathedral ceiling that opens into a spacious Great Rm with a towering custom FP. Maple wood floors continue into a Gourmet Designer Kitchen with high-end stainless appls, maple cabinetry, Antique Persa Granite CTs, a huge island, & a pantry with a fridge, freezer & storage. The formal Dining Rm is perfect for special occasions, or take the french doors out to a huge partly-covered patio with a Golden Quartzite FP, plantings & a palm tree, BI speakers for the homes sound system, & a yard with south exposure. The 790 sqft Owners' Suite has a lounge area, dual WI closets, patio access, a 2-sided gas FP, & a 6 pc spa ensuite with a 2-person jetted tub, heated Italian tile floors, a marble vanity, maple cabinets, & a custom WI shower. Completing the main level is a bright Office, a 2 pc Powder Rm, a large Coat Rm, & a Laundry/Utility Rm with access to the 3-car garage with a 2 pc Bath. Handcrafted curved staircases lead to separate wings with laundry: the east wing has a Family Rm & 3 Beds with WI closets & semi ensuites, the west wing has a Guest Suite with a WI closet, a Bedrm with a WI closet & semi ensuite, & a Media Rm with a 110" screen. The 2900 sqft lower level is partially finished, there's lots of parking & a sani-sation for RVs, & the superb location offers quiet country living just mins from Parksville & Qualicum. See our website for more photos, floor plans, VR Tours, & more!